1-800FASTBED - Futons Long Island, New York, buy at factory direct prices Gold Bond is one of the world's top manufacturers of quality futon mattresses, best quality materials, craftsmanship, durability and value. From our simple all-cotton pads to the extraordinary Visco and innerspring models, a Gold Bond is the ultimate choice in futon mattresses. 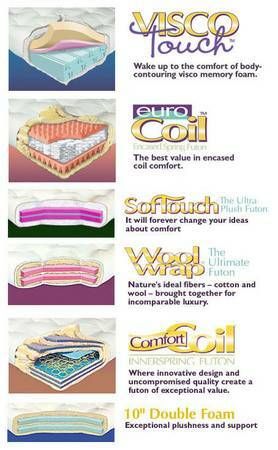 At the heart of every EuroCoil mattress is our encased coil innerspring unit. Comprised of hundreds of individually wrapped, heat-tempered carbon steel coils, each acting independently to eliminate motion transfer while providing exceptional comfort. Add layers of super-soft foam and wrap it in our exclusive JOY® natural cotton batting and you've got a plush sofa-like feel with healthful nighttime support. Engineered with our exclusive SuperCenter innerspring unit to provide firm, restful support while folding effortlessly in half, the ComfortCoil is the ideal futon mattress by day or night. 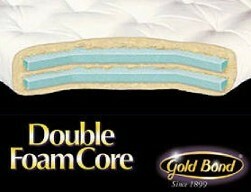 Gold Bond's own blend of cotton batting coupled with two layers of super-soft foam ensure that the ComfortCoil lives up to its name. The Double Foam Core futon mattresses feature simple, traditional comfort with the natural benefits of our JOY® cotton blend and the suppleness of two layers of foam. Wool is recognized as the most resilient natural fiber on earth, with outstanding comfort and insulating properties. The WoolWrap mattress starts with the finest high-resiliency double foam core surrounded by 50 lbs. of pure cotton. All of this is surrounded by an ultra-thick layer of New Zealand wool for luxury, support and long-lasting comfort--day or night. 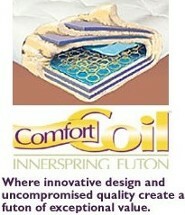 8"Comfort Coil - Today’s best innerspring futon value. Innovative SuperCenter Innerspring Unit allows the ComfortCoil to fold easily, yet provide firm, healthful support. With four layers of super-soft foam and Joy® cotton batting. Two 2" layers of 1.2 density foam and joy cotton batting. Provides greater plushness and softness than single core futons.